If i knew how to do templates…. Does that really belong in this wizard? “Create new project from template” should give the user a minimal file structure with minimal file contents for the respective project type, on top of which he can start building his program. Cloning an existing project (even if if it’s just an example application) is something different imo, which is already handled by the “Fetch Project” dialog. Why? Why not just let the description & screenshot change when another programming language is selected? I would horizontally split the right column. The Preview is not correlated with the programming language. And maybe I would would move the language up and the preview down. @smls: Great mockup in comment #2. Have you talked to the Calligra developers? If I recall correctly, they had a very similar problem they needed to solve recently, and they did a lot of usability research to find out the best way to solve it. You should find out how they did it and see if it can be adapted to kdevelop as well. @uniq: I thought the same thing when I first saw the screenshot… After splitting, one could even remove the white background from the preview box, just draw a border around it or something, it would differentiate it even more. However, I don’t think this is such a big issue, and even with the way it is now, users will understand what’s goin on. I think the Qt templates shouldn’t be in the KDE group. Either make a new group called KDE or rename it to eg. “Qt/KDE.” It took me a few moments to find where the Qt templates are, because I don’t do any KDE development, but I use Qt. Yes, it’s only a few seconds, but even those few seconds can improve the user experience. I think that to apriori (=before you write any actual code) decide whether you are going to end up implementing “KDE 4 GUI Application” or “KDE 4 KPart Application” or “Plasma Applet Template”, or whatever else, is an illogical approach. The problematic part of the apriori choice is that it fixes the project to a particular predetermined path. Predetermined is wrong. KDE applications are closed, which is bad and irrational. Developers cannot *freely* use an application’s sub-functionality, because the way applications are hard-wired makes such uses impossible. Take KCalc for example: KCalc is *not* something a developer could use in other projects. Obviously, KCalc can do math calculations. What if I want to use KCalc’s ability to do math calculations (without KCalc’s GUI in 1 case, with KCalc’s GUI in a second case) – can I do this easily (in 5 minutes)? No, I cannot. And it *is* completely irrational that I cannot do it easily. There is something fundamentally broken in the way KDE is architected. 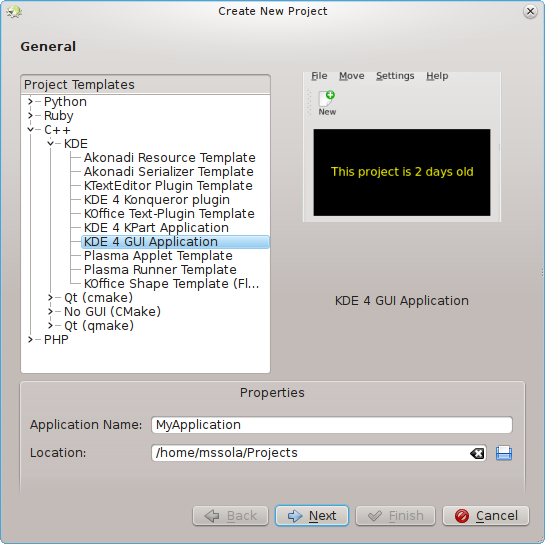 The ideal state would be: When a KDE developer is creating a new “application” such as KCalc (somebody had to create KCalc initially), he or she is AT THE SAME TIME (CONCURRENTLY) AND WITHOUT EVEN KNOWING ABOUT IT creating components for other developers to use. This of course assumes that applications are open. It is what I would call effective development process. Compared to this, the current way of KDE doing things is inferior (because having 1 strategy is always inferior to having 2 concurrent strategies (chess)) and cannot efficiently bring about new components for other people to use in their projects. What I described here is not a new technology. It has an age of at least 30 years. See Smalltalk and Squeak. For a somewhat newer installment, see the Go language (such as: why Go doesn’t have class hierarchies). Thanks for your constructive approach… “?”. #10: KDE already splits off functionality into freely available shared libraries or reusable components (kpart’s, data engines, etc.) more than most other software collections in existence. If you have constructive ideas for how to further improve this (and make it more transparent to application developers, as you demand) without abandoning C++/Qt, feel free to express those ideas. 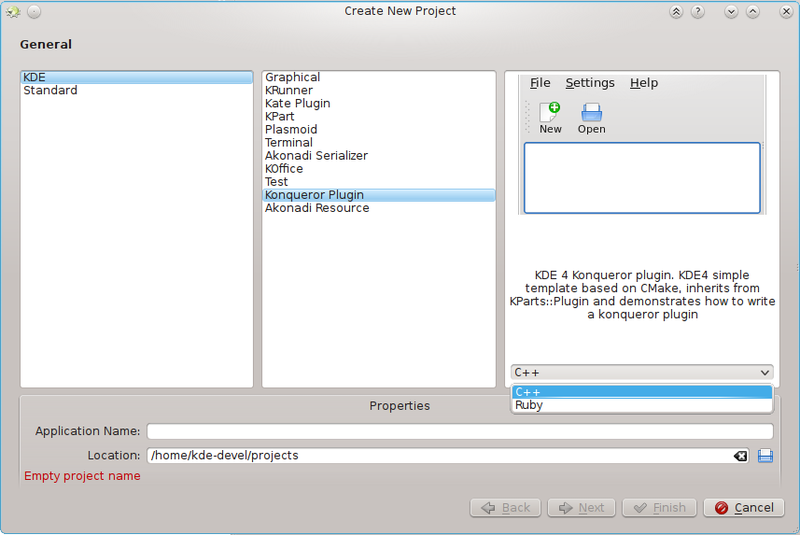 For KDE application development this looks great. KDevelop is also a great general purpose IDE, and I wonder if the above approach might lead people to assume kdevelop only really targets KDE development; perhaps if you tried to balance the option trees (they still are trees) a bit? IMO having language as the top-level choice would be better. Let me explain why. 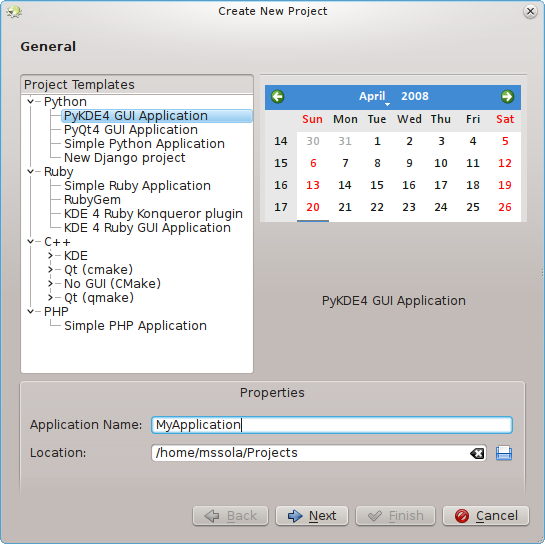 Assume that I decided to write a new KDE application using python. So I fire up the “New Project” wizard. Let’s see, there’s a KDE application. OK, let’s choose this one. Yeah, it will be GUI application, so select “Graphical”. But hey, there’s no Python available! Hmm, now I see there’s “Python” too. So let’s select it instead of KDE. I guess “Simple Python Application would suffice.” Wohoo, finally I have a python project. See the problem? The language plugins may not provide templates for all categories. However if any other plugin provide such template it may confuse the user so that they check this category first but they find nothing so they need to check other categories. Having language as the top level choice is not perfect, because many projects use more than one language. I understand that. But you can’t (if you can, you’re my hero) write in two languages at once (I mean something like that you write python with your left hand and C++ with your right hand using two keyboards). You’ll probably decide what you will implement first and what language you’ll use for that. So you have a clear choice here. The rest depends on which templates are available. My point of entry as a newbie is trying to get a fairly large project running. Bullet physics to be precise. Things build and compile quite nicely, but when it comes to debugging, nothing seems intuitive. Debug and Execute buttons don’t launch anything and there are no messages just silence. I presume they can’t find the executables, but i can’t find any dialog to adjust them. The only help i can find is online and the GUI has changed too much for them to be useful. I think, at least, there should be some standard output if you press a button and the action fails. I’m able to get to some dialogs, like “add custom library path” by hovering over red-underlined #include statements, but i can’t figure out how to open those dialogs from the menu. It’s frustrating not to have any debug windows – step over, step into etc. anywhere in the menus or toolbars But i presume they will magically pop up once i learn how to build a debug target? generally though, it’s a pretty nice system. My problems were 2 fold. 1. When i clicked Run->Launch, I was confused because i was presented with three projects and clicking on them does nothing. There are + and – buttons, but i presumed they were to add more projects or delete them. It wasn’t until i read the bug report below that it was clear this + icon was needed to expand the folder and get the options. I think having expansion arrow beside the folder would be more consistent with the KDevelop environment. GDB cannot use the tty* or pty* devices. I followed the instructions, but on my ubuntu 11.10 asus laptop I don’t have any pty* files in /dev. Could not start program ‘konsole –noclose –workdir /home/kesten/VersionControlProjects/Bazaar/Engines/Bullet/cmake-build-2.79/Demos/SerializeDemo -e /home/kesten/projects/SimpleCmakeKdevelopApp/build/simplecmakekdevelopapp’. Make sure that the path is specified correctly. On a hunch, i guessed that the path was right but konsole was not installed.